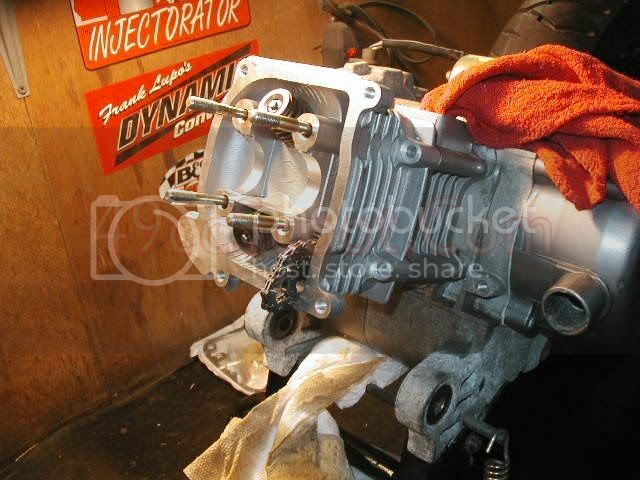 The installation shown here is being done on a 139QMB 50cc GY6 scooter engine. 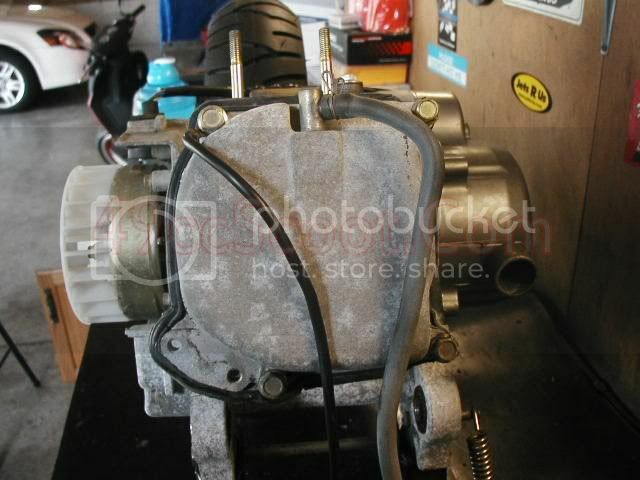 I was using a 72cc big bore kit. Installation of larger or smaller (even stock replacement) kits should very similar. Even 125-150cc GY6 procedures should be nearly identical. Some specifications (torque specs, ring end gap, etc..) may vary for different applications. 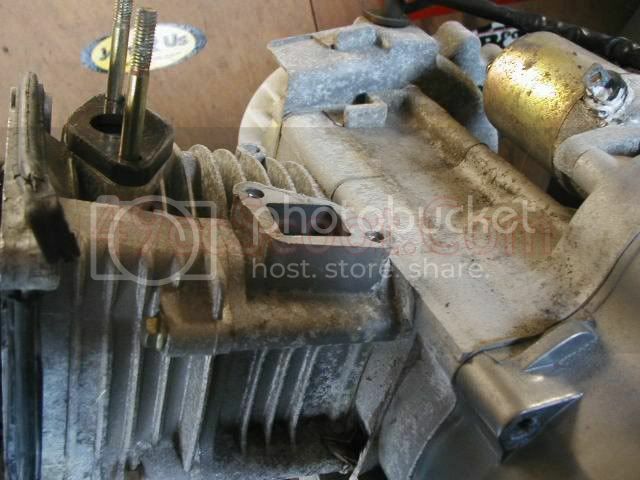 I like to start by pulling the engine out of the scooter and putting it up on my workbench. 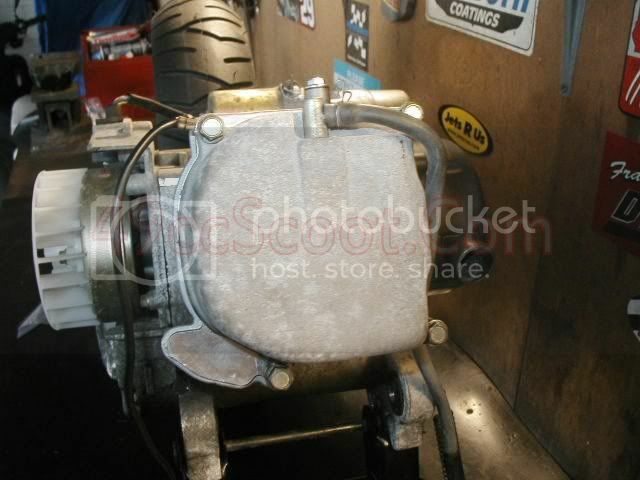 Sometimes the engine can be worked on inside the scooter, but the frame on many scooters prevents big bore kit installation while the engine is still in the scooter. 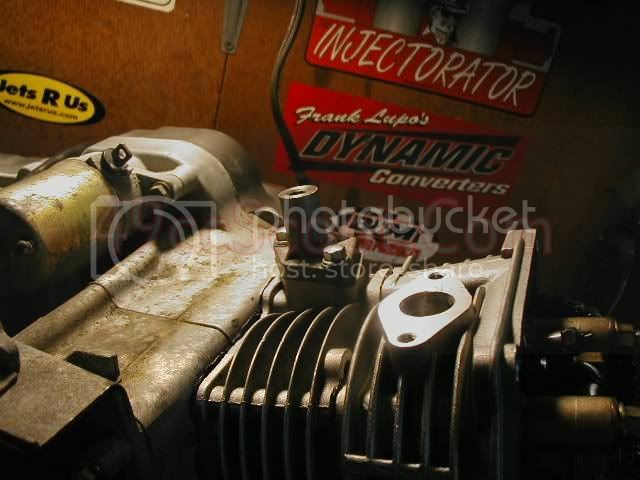 Pulling the engine generally involves removing the carburetor, rear shock(s), starter conections, grounds, brake cable/hose, and the engine mount bolt. 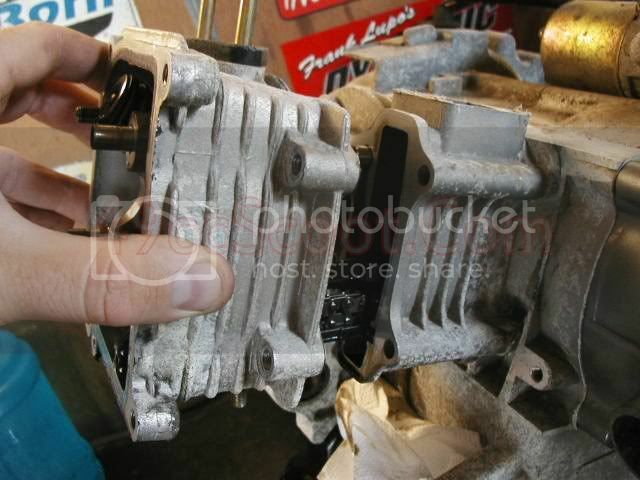 Assuming you removed the carburetor to get the engine out, the next step is to remove the two nuts holding the intake manifold. Then slide the manifold off of the studs. 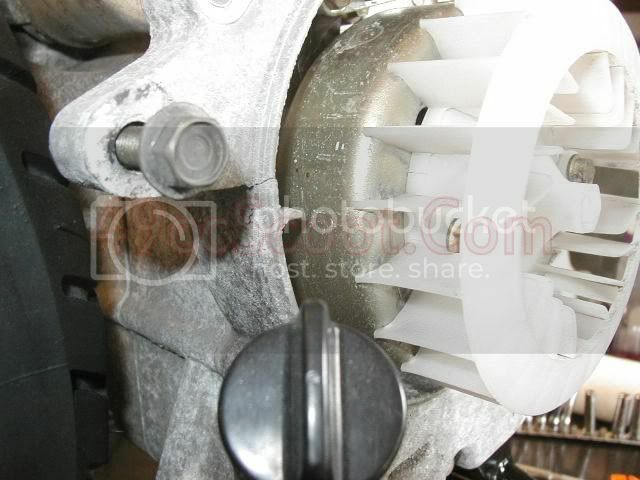 Now remove the two screws holding the cam tensioner cover in place and remove the cover. This step is not always necessary, but sometimes it's easier to maneuver the engine covers with this off. 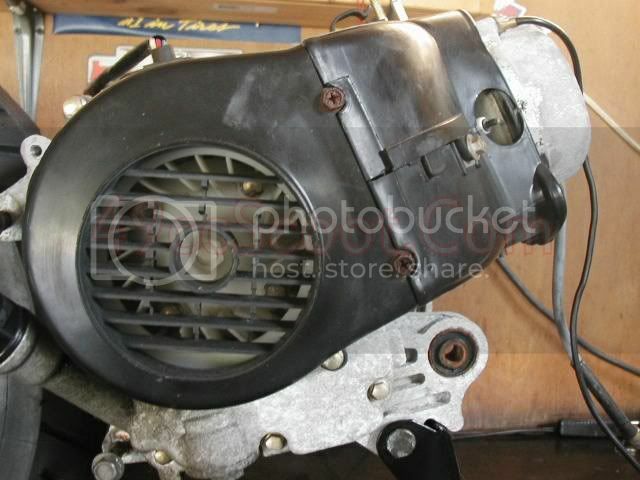 Next, remove the bolts holding the engine and fan covers on and remove the covers. 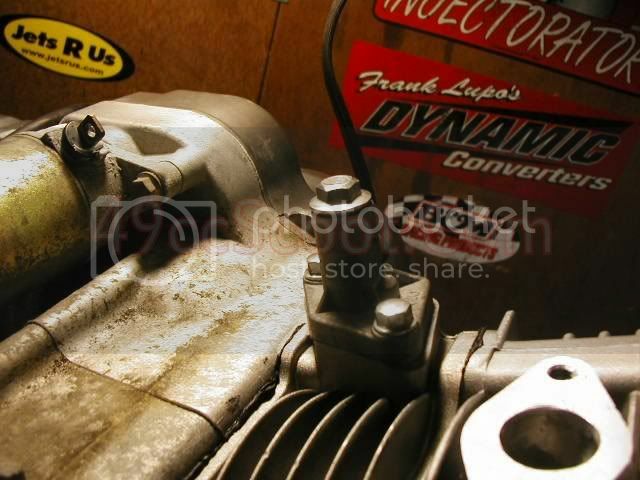 Remove the 4 bolts holding the valve cover on and remove the valve cover. Some models may only have 2 bolts. Rotate the flywheel until the "T" mark on the flywheel lines up with the cast in timing mark on the engine case. 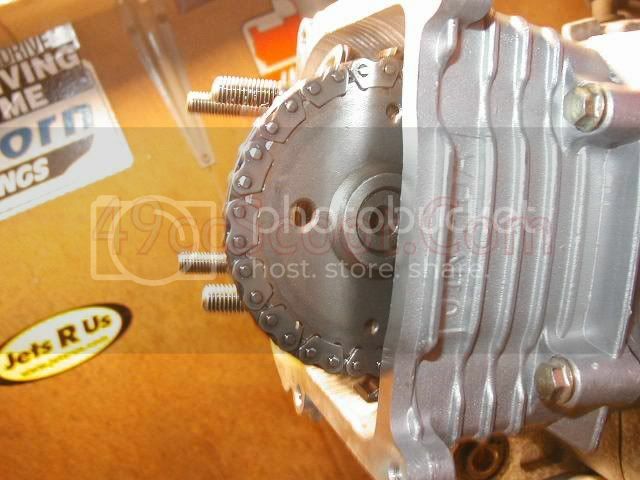 The cam sprocket should look like the image below. 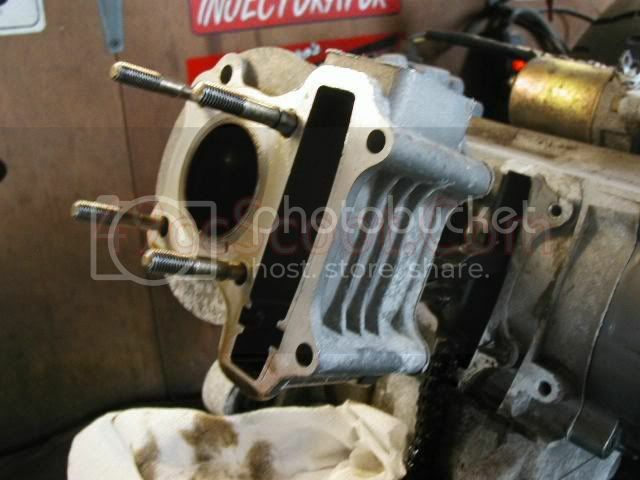 The large hole should be to the very front of the engine, perpendicular to the top edge of the cylinder head. The two smaller holes should be parallel to the top edge of the cylinder head. If the marks appear to be on the wrong side of the sprocket, rotate the flywheel 360 degrees to line the timing marks up again, which should move the cam sprocket 180 degrees and line the marks up properly. 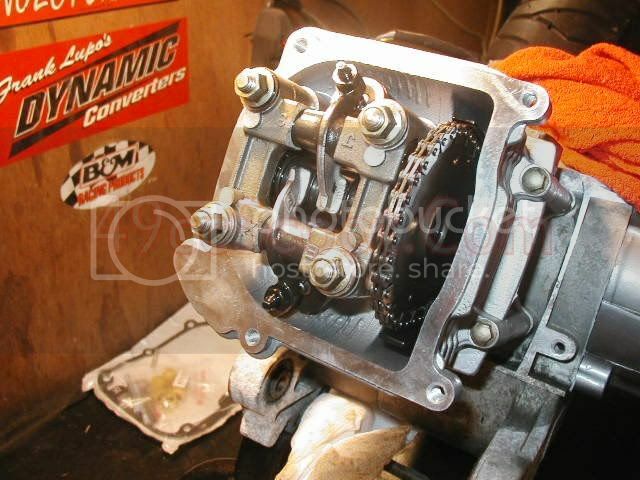 Now remove the bolt, gasket, and spring in the cam chain tensioner. Some models may have a screw with a knob that looks like a flathead screw below it. For those models, just remove the screw. 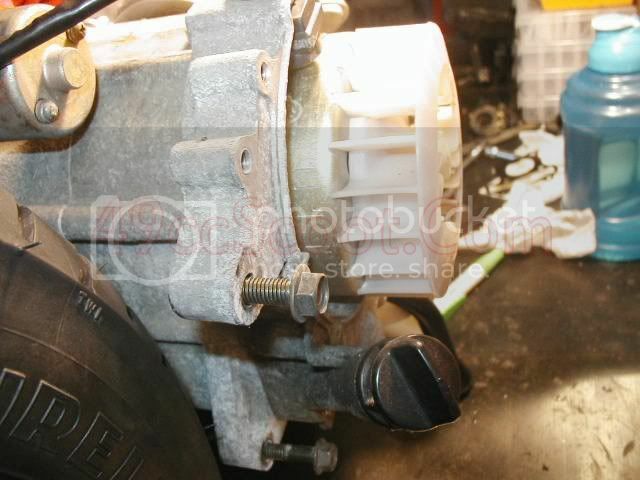 Next, remove the two bolts holding it and remove the cam chain tensioner. 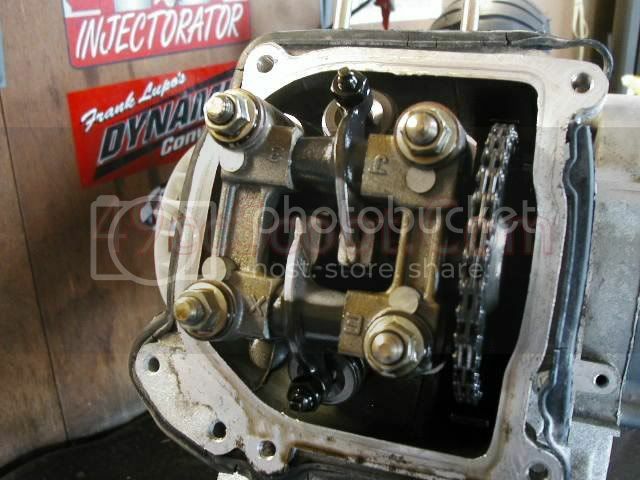 Remove the four nuts holding the camshaft holder and rocker assembly in place and remove the cam holder. 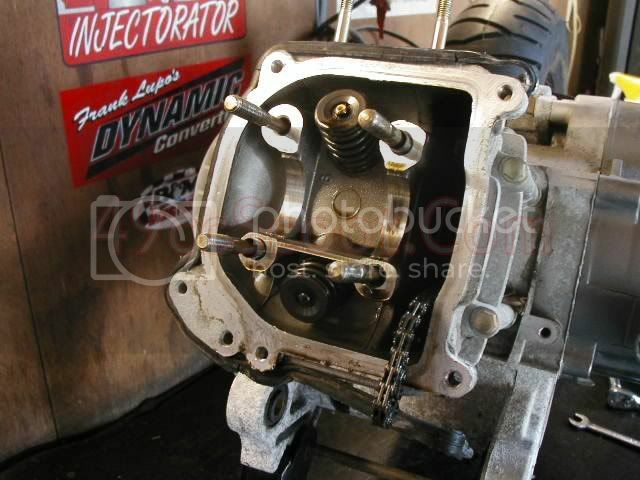 Remove the camshaft from the cam chain and pull the cam out of the cylinder head. 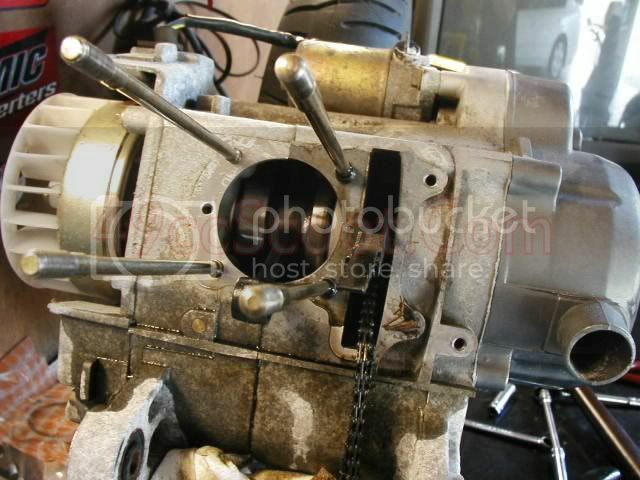 Now remove the two bolts securing the cylinder and head to the engine case. Pull the head off of the cylinder and studs. Next, remove the head gasket. Now you'll need to free the cylinder from the engine case. Sometimes it will just pull off, but not usually. You may need to tap it gently with a rubber mallet while pulling on it to break it free. 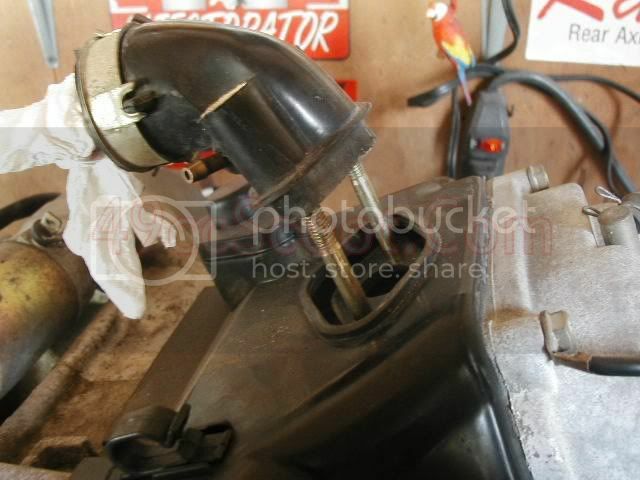 If that wont work, you can try to gently pry the cylinder loose. Be careful not to damage the case or cylinder mating surfaces. 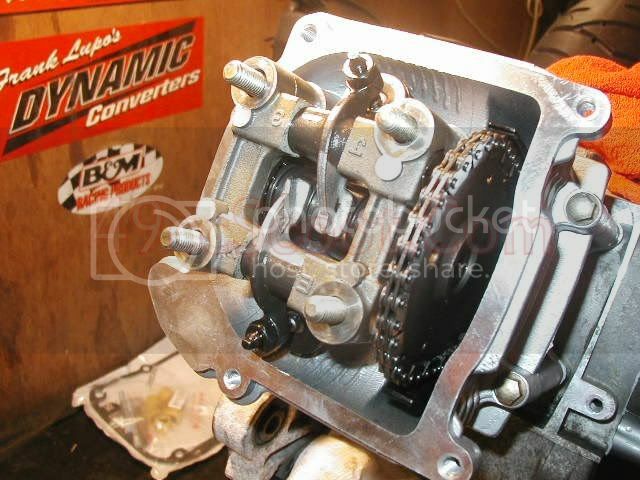 Remove the lower camshaft chain guide by simply pulling it outward. Pull the cylinder the rest of the way off. 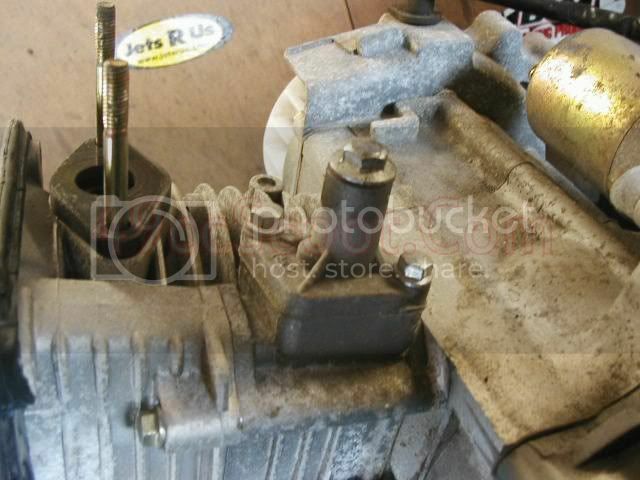 Now remove the guides left in the cylinder or cylinder head. They should pull out by hand or with pliers. Be sure not to crush them if using pliers. 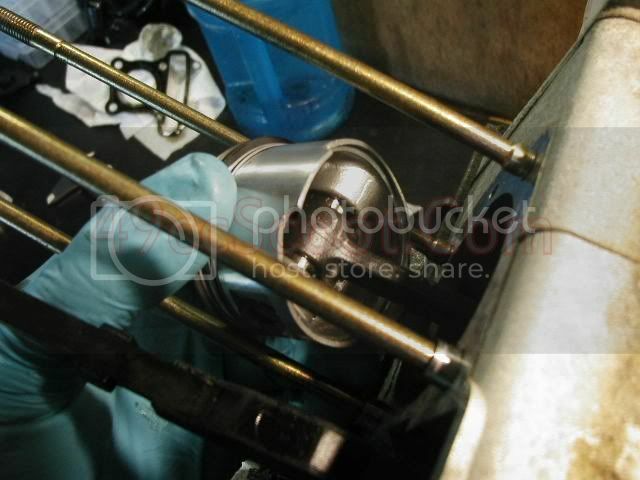 The next step is to remove the circlips from the piston. Circlips are the little clips that hold the wristpin in place. They can be pulled out using needle nose pliers. 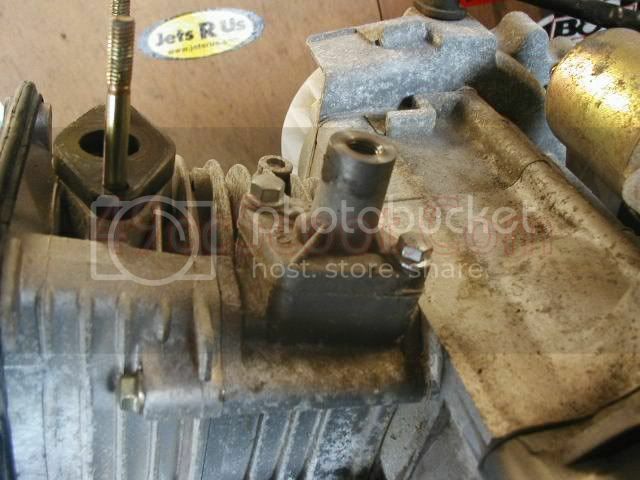 Once the circlips are removed, you can push the wristpin out and take the piston off of the connecting rod. There are special tools to pull the wristpin, but you can use a very small socket to push the pin out. It's a good idea to stuff some rags into the bore and camshaft chain openings in the case to keep debris out while you do some prep work. 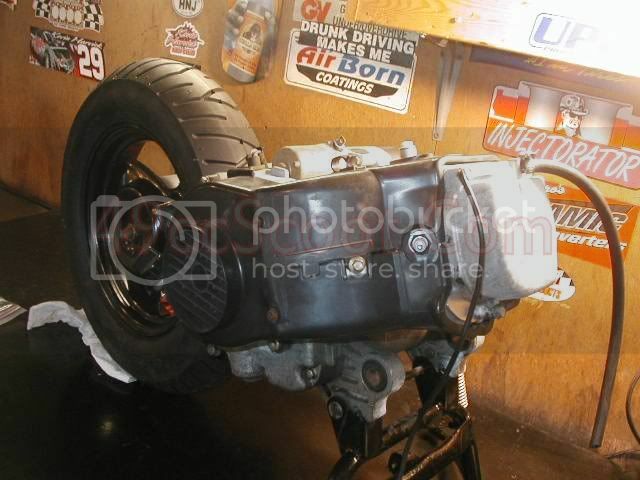 Now it's time to begin prepping your big bore kit for installation. 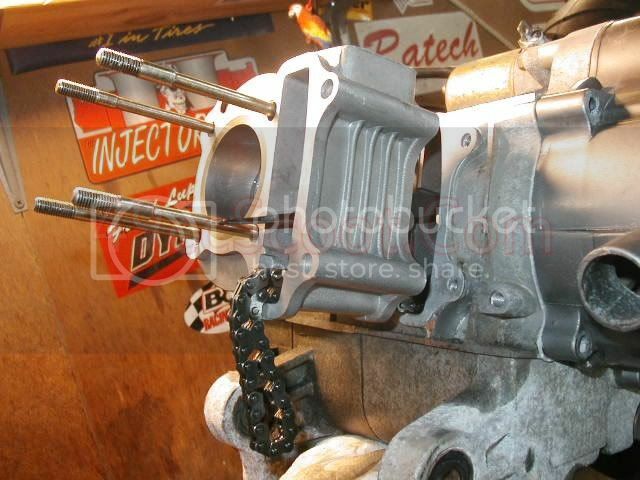 Of course you need to start by setting the big bore kit beside the stock cylinder and piston so you can imagine the additional power you'll be feeling with the new larger parts. While you are comparing, make sure the bolt patterns are the same and look for any other potential issues. 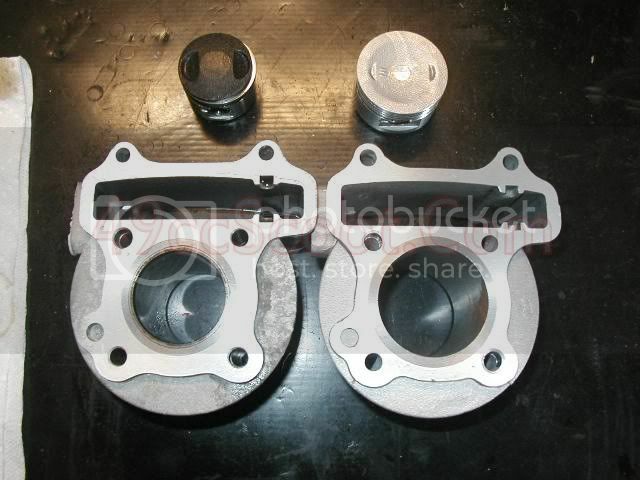 The image below shows the difference between a stock 49cc 139QMB cylinder and piston and a 72cc big bore kit for the 139QMB GY6. 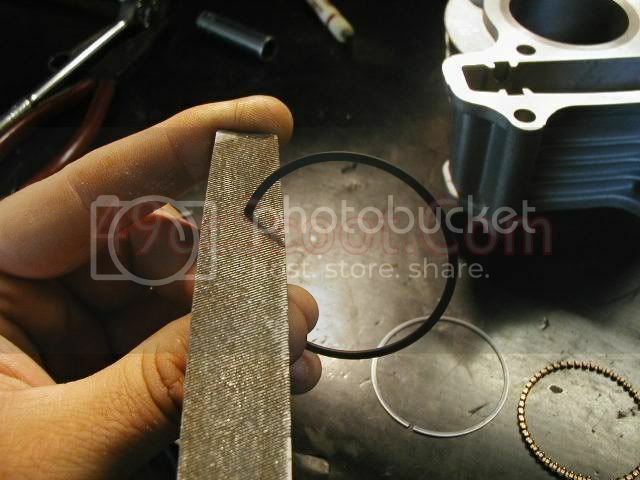 Next, you will want to prep your piston rings. 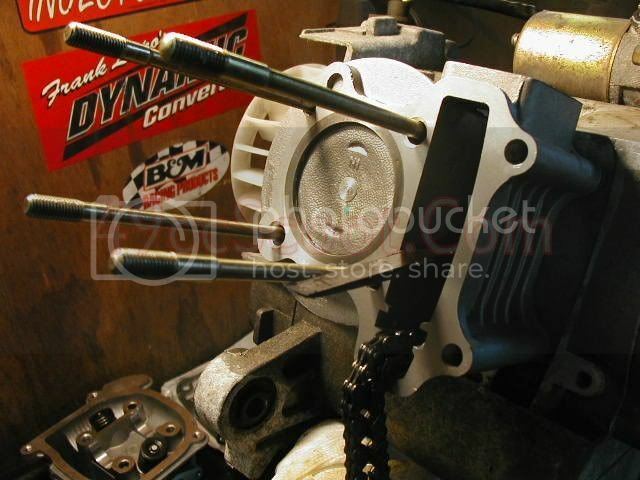 Start by determining where your piston rings should be installed on the piston. 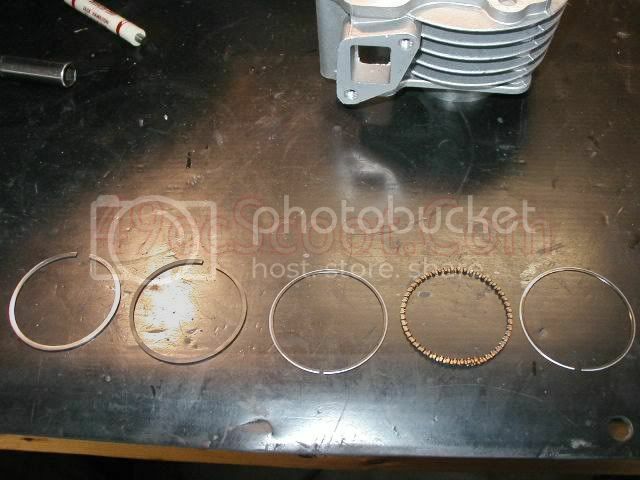 You should have a total of five piston rings. 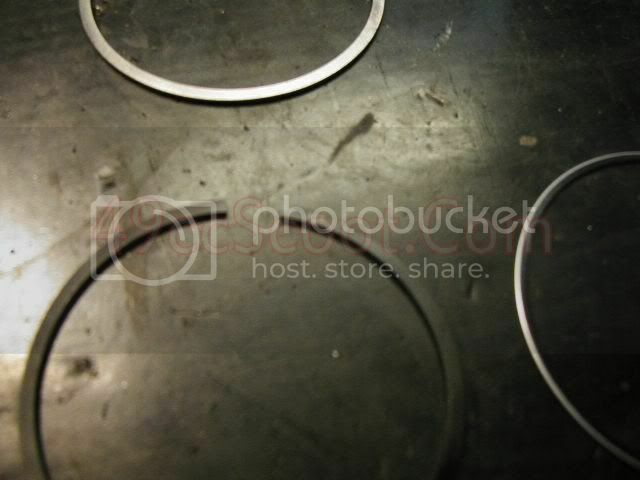 Two thick metal rings, two very thin rings, and one wavy piston ring. The two thick rings are called compression rings, the other three are often refferred to as one oil control ring because they all fit into one ring land (thin rings on the outside edges, wavy ring in the center). As their names imply, the top two rings are primarily used to control compression and seal the clylinder and the lower ring(s) is used to control oiling. Take a close look at the compression rings. They are usually meant to be installed in a certain order. Sometimes they are colored to let you know which is the top ring and middle ring and sometimes they will be labeled with a "1" and a "2" or other markings. A common coloring is one black and one silver compression ring. In this case, the silver ring should be the top ring and the black ring is the middle ring. While you are checking out the compression rings, take note of any markings. Only one side of the ring should have markings on it. 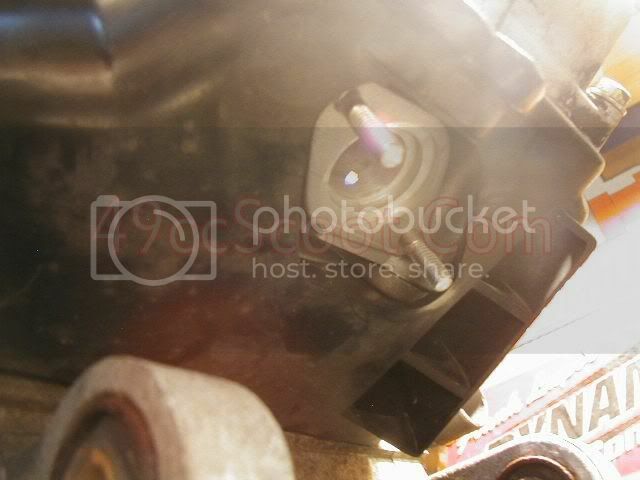 This is the side of the ring that will face up when installed on the piston. Now that you know where all the rings go, it's time to set the ring end gap on the compression rings. Ring end gap is the distance between the ends of a piston ring when it is installed in the cylinder. An end gap that is too small can cause cylinder scuffing and too large of a gap will cause poor sealing and excessive blowby. You'll need to determine the distance to set the end gap. 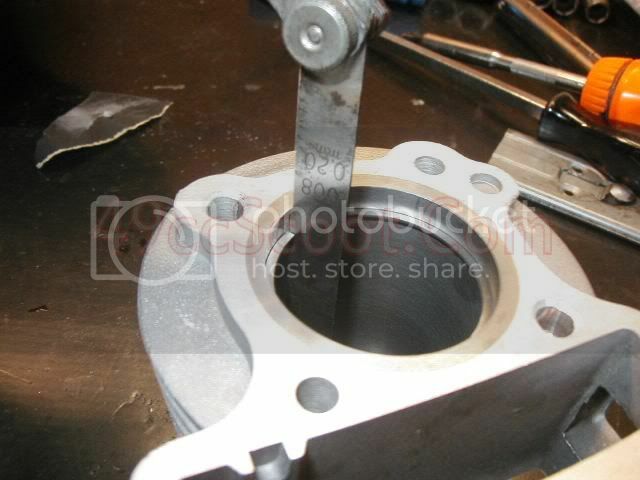 A good rule of thumb is to set the end gap for the top compression ring to .004" per inch of cylinder bore. Set the second end gap to .005" per inch of cylinder bore. Top Compression Ring End Gap = Bore Diameter" x .004"
Second Compression Ring End Gap = Bore Diamter" x .005"
Since these measurements are done in inches, you'll need to convert your bore diameter from mm to in. 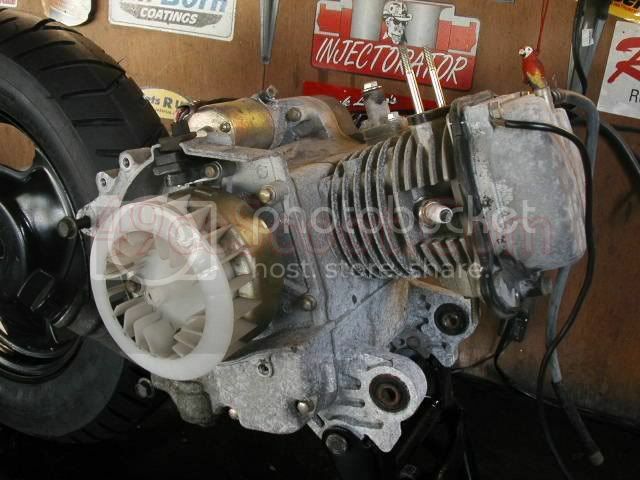 For example, my 72cc big bore kit uses a 47mm bore. 47mm / 25.4 = 1.85"
1.85" x .004" = .007"
1.85" x .005" = .009"
I'll need to set my top compression ring's end gap to .007" and the second compression ring's end gap to .009". 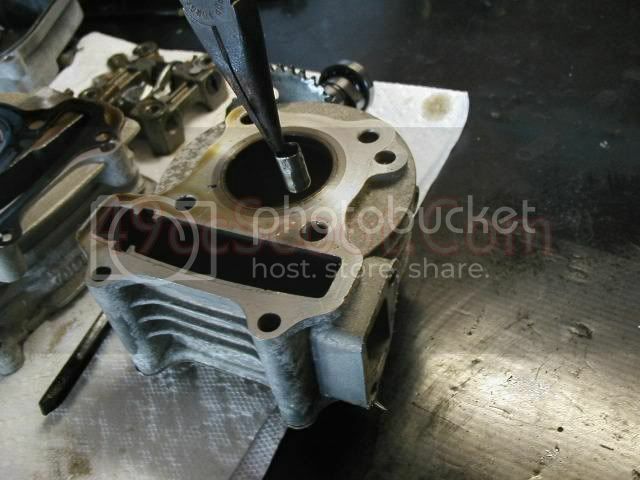 To set end gap, begin by placing the piston ring in the cylinder. 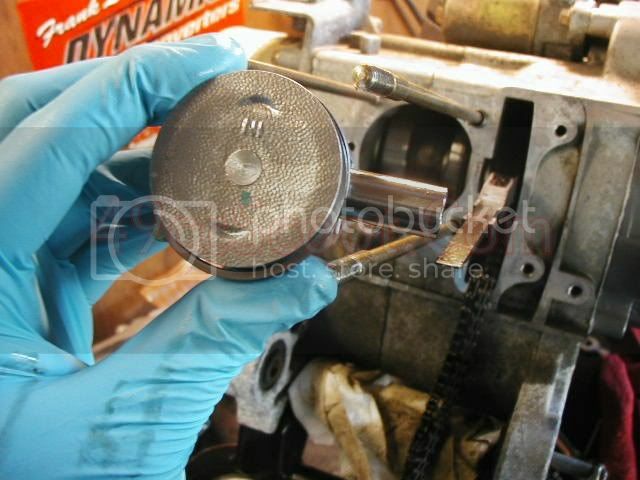 Make sure the marks are facing up just as it would be installed on the piston. 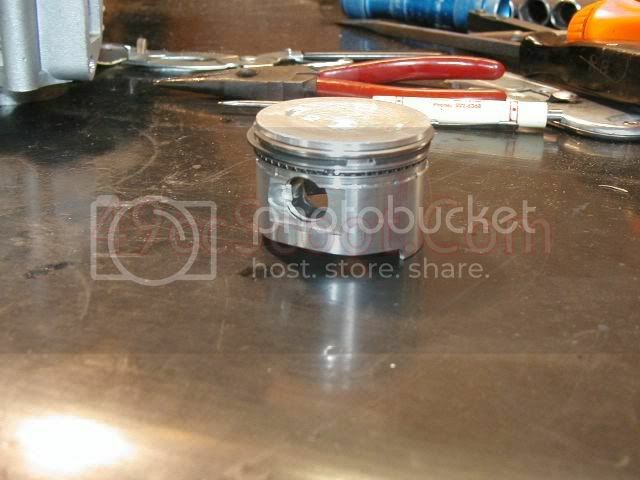 Use the piston to make sure the ring installed straight so you can get an accurate measurement. 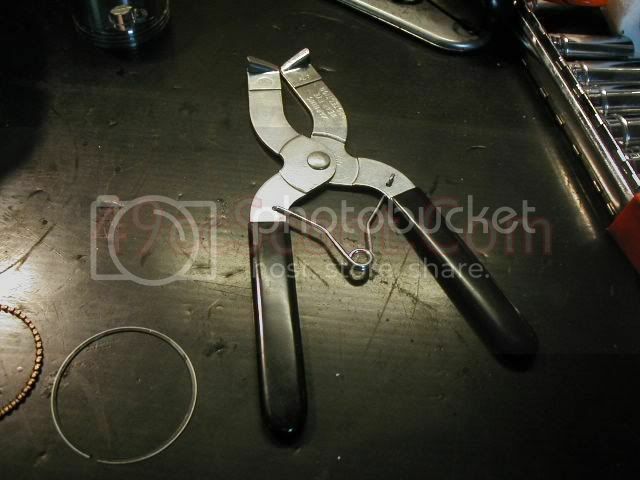 Now use feeler gauges to measure the distance between the ring's ends. If the distance is too small you can file the ends of the ring and recheck. Be careful not to damage the ring. 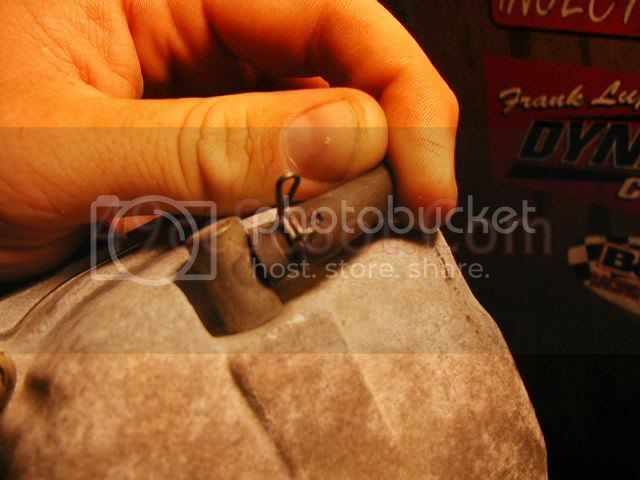 Apply light pressure and try to maintain the original angle of the ring's ends. If the end gap is too large your only option is to get new rings or if they are close to the gap needed, just use them. Once your rings are gapped properly, it's time to install them on the piston. I suggest using a piston ring expander tool. You can pick one up pretty cheap from most auto parts stores or possibly rent one long enough to do the job. 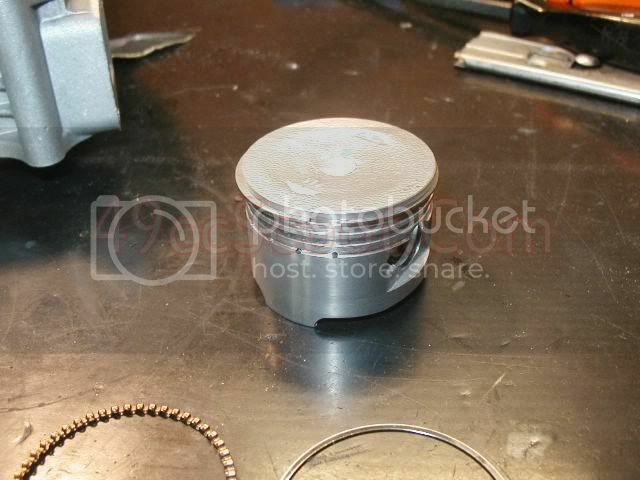 Start by putting the top compression ring in the expander tool and opening it just wide enough to fit over the piston. Be very careful not to spread the ring too far and break it. 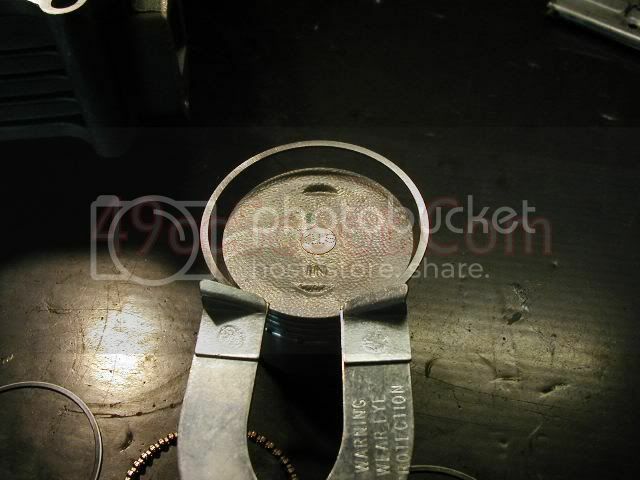 Move the ring into position in the top ring land and slowly release the pressure from the piston ring expander. Make sure the ring is in the ring land all the way around the piston. 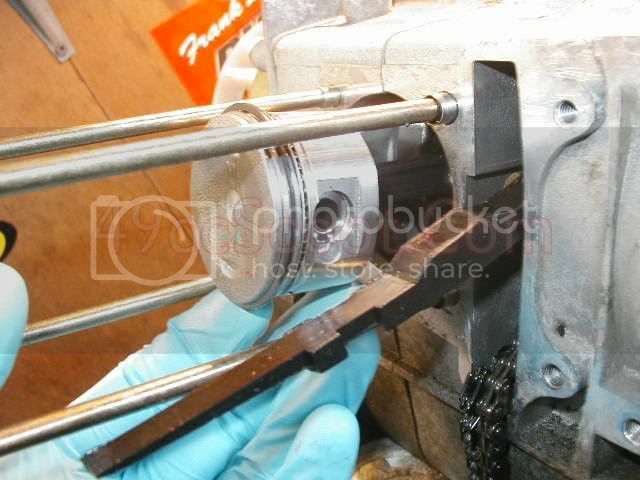 Some people like to use assembly lube or two stroke oil to coat the piston and/or rings for this process. I do it dry. Repeat this procedure, placing the 2nd compression ring into the middle ring land. You can go from the top or bottom to install the 3 oil control rings. Make sure the two thin rings are on each side of the wavy ring. 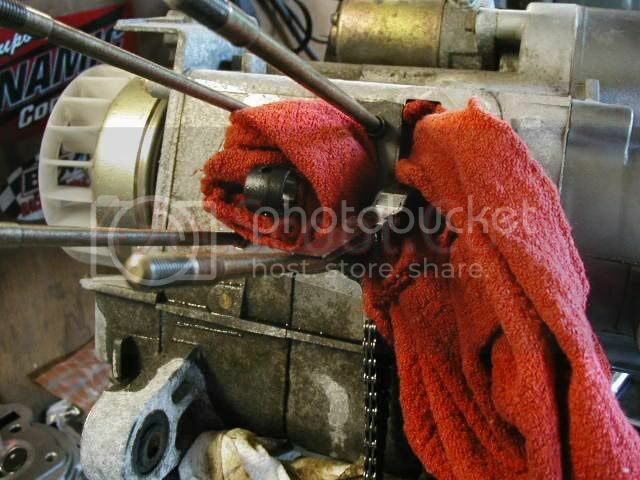 Apply assembly lube or two stroke oil to the wrist pin, the guide in the piston, and the inside of the connecting rod and slide the wrist pin in as far as you can without it protruding into the center of the piston. 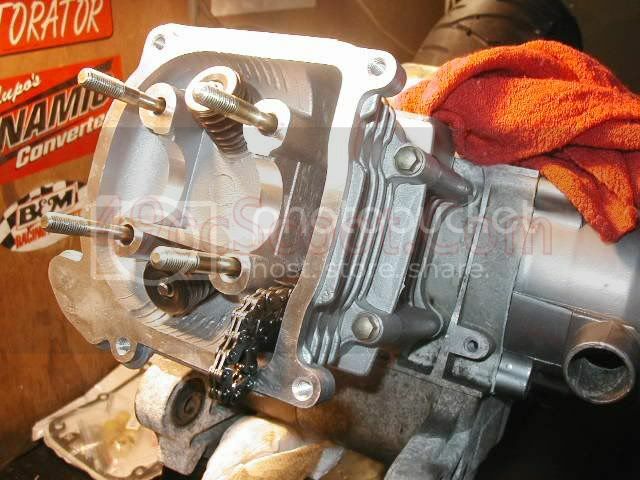 I remove or reposition the rags gaurding the crankcase from debris to give me a little more room for movement in this step. 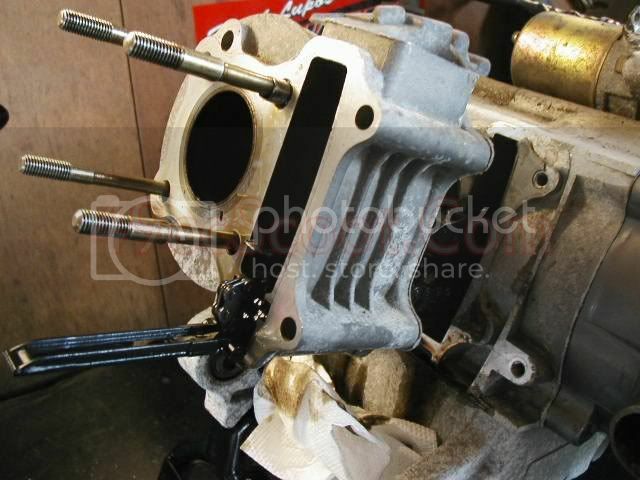 Note the position of the valve reliefs in the top of the piston. The one labeld "IN" should be at the top when installed. 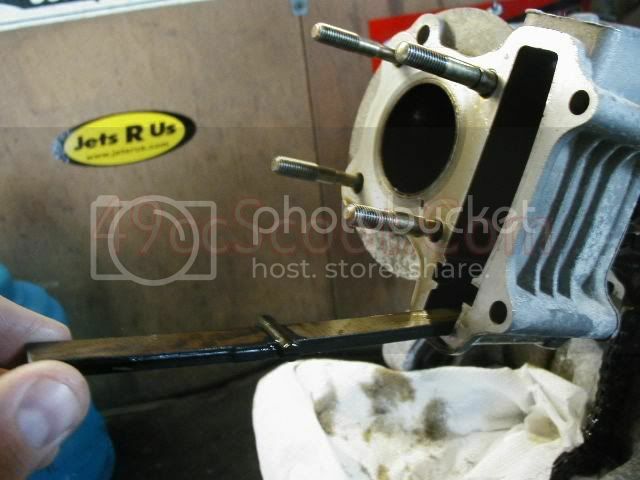 Slide the wrist pin through the connecting rod so that both ends are flush with the inside cutout of the piston. 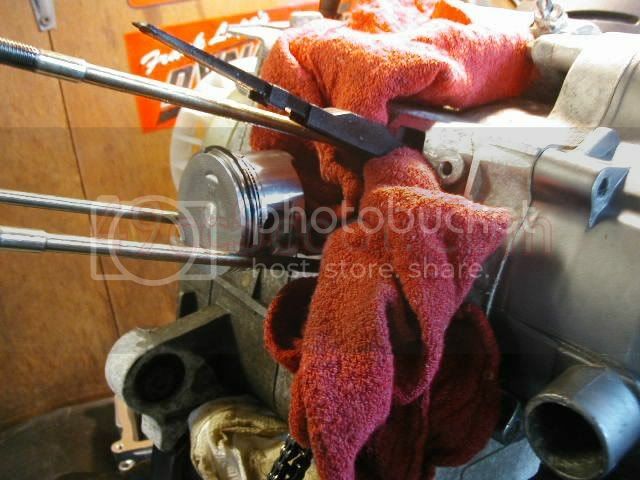 I replace the rags in the crankcase for the next step. Circlips sometimes spring out when you are trying to install them and you don't want them in your crankcase. Install the circlips on both sides of the wrist pin. This can be tricky until you get the hang of it. I push one side into the reciever groove for the circlip. Then grab the other side with a pair of needle nose pliers. Twist and push a little and the circlip should go into place. You may find that another method works better for you. Make sure the circlip is tight in it's groove. 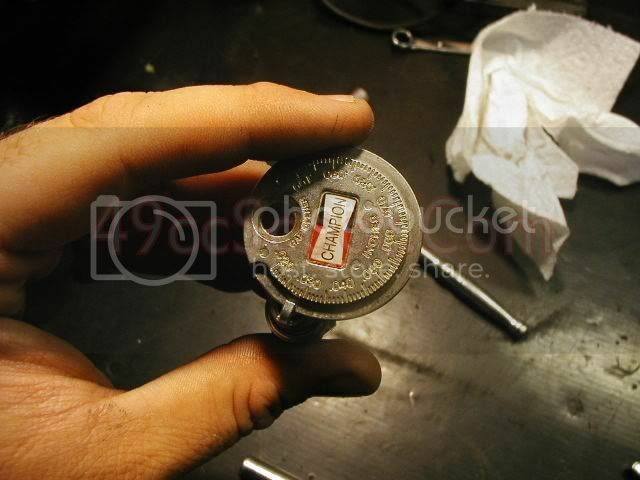 Move the clip so that the opening is toward the top or bottom, not sides, of the piston. 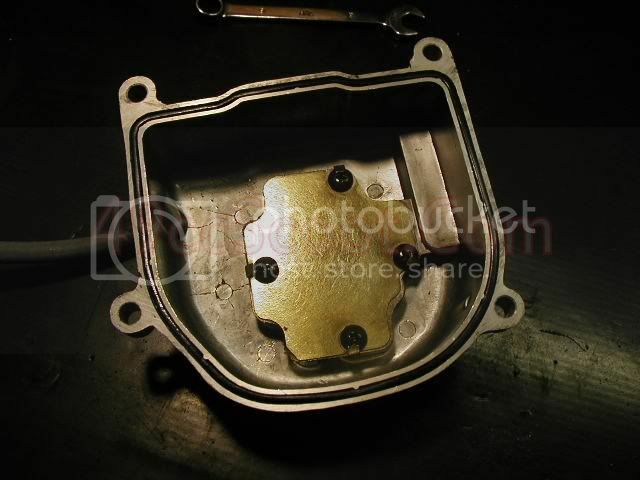 Clean the mating surface of the block and install the base gasket and locator dowels. 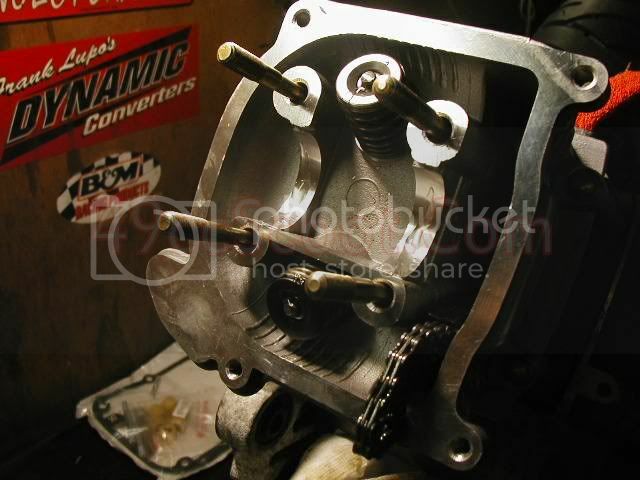 Put a coat of assembly lube or two stroke oil on the piston and on the inside of the cylinder and rotate the piston rings so that no end gaps are lining up with each other. 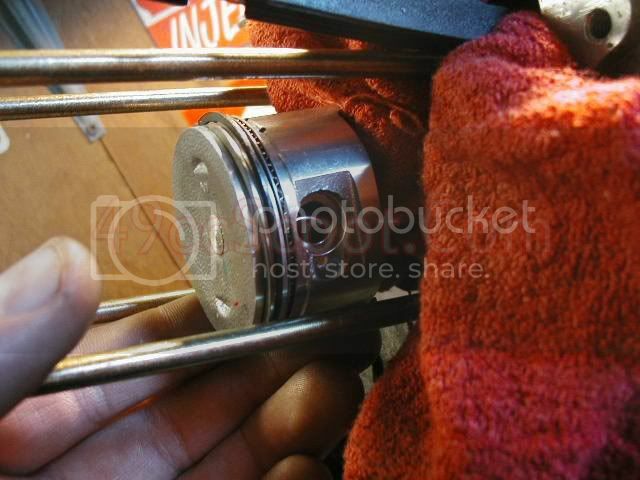 Gently slide the cylinder over the piston, being sure you don't snag any rings. You will probably need to use your fingers to keep the rings compressed as you slide the cylinder over them. 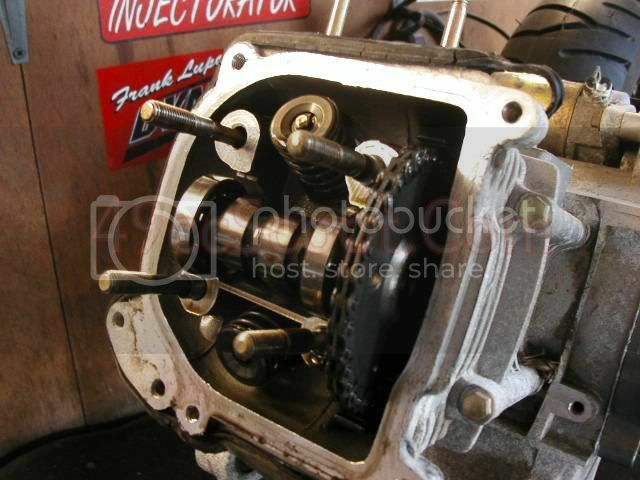 Once the rings are all inside the cylinder, pull the camshaft tensioner though the cylinder. You can see in this pic that I forgot to replace the dowels and had to remove the cylinder to put them in place. D'oh. Slide the cylinder in place until it is up against the engine's case. 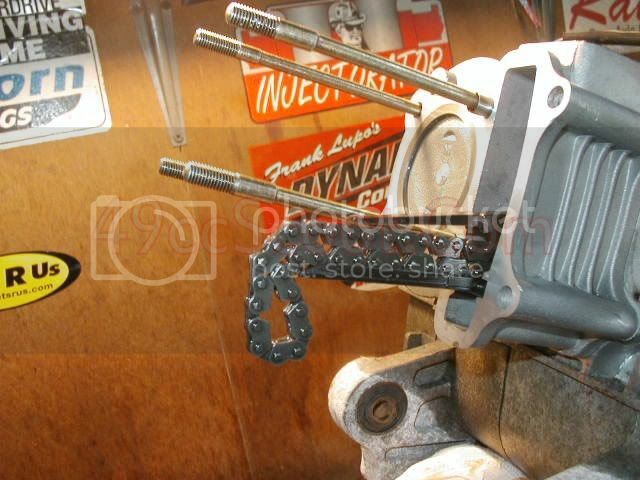 Next, slide the camshaft chain guide into place in the cylinder. 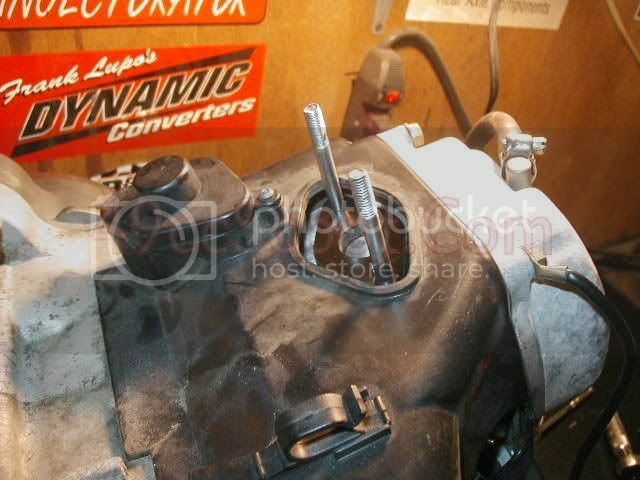 Install the locator dowels and the head gasket. 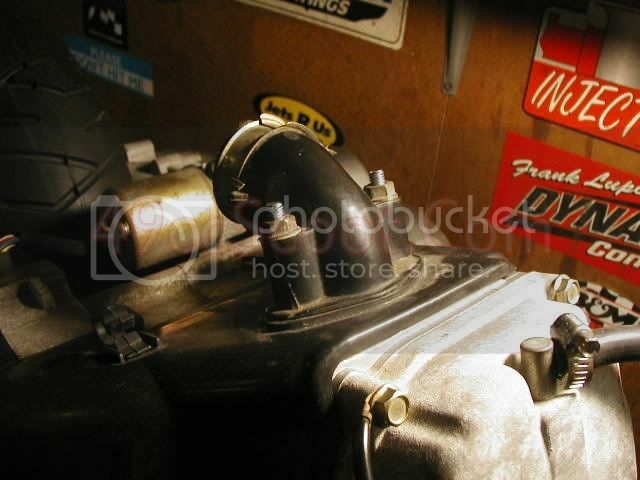 Slide the cylinder head into place with he intake port facing up. 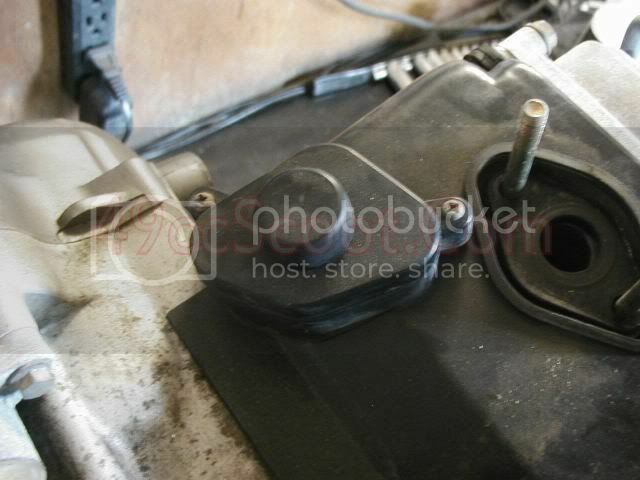 Install the two bolts on the side of the cylinder finger tight. 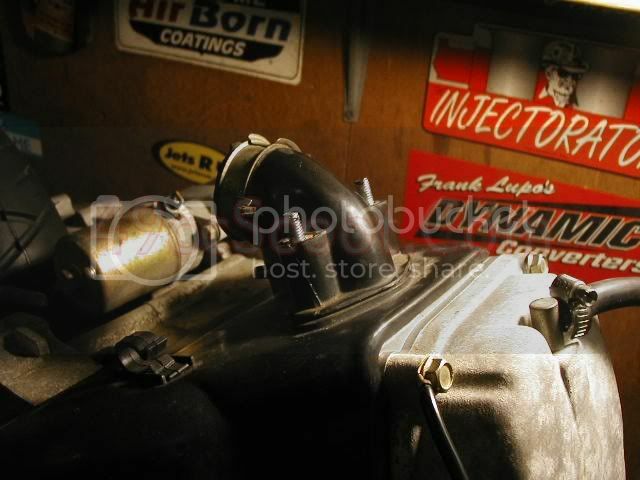 Check to ensure the engine is still on top dead center ("T"). Apply assembly lube or two stroke oil to the bearings and lobes of the camshaft and the races in the cylinder head and camshaft holder/rocker assembly. 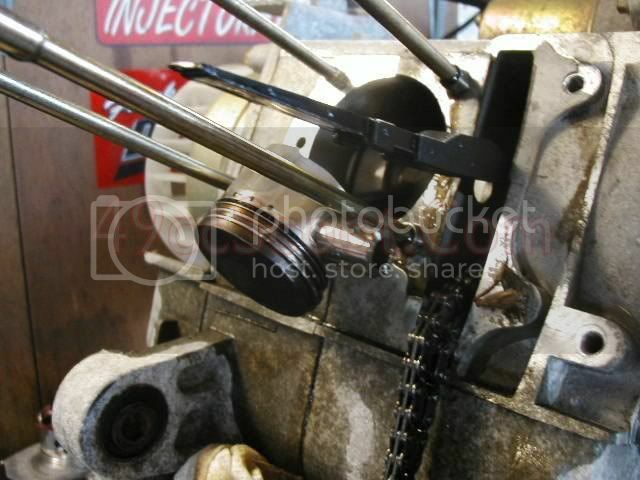 Install the camshaft into the head and cam chain. 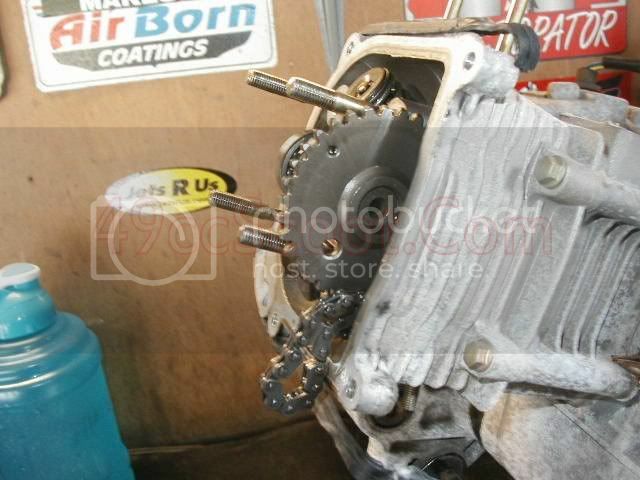 If installed properly the timing marks on the cam sprocket should line up just like before. If they are off a little, remove and retry until you get the marks aligned as shown. Put the locator dowels in place and slide the camshaft holder/rocker assembly into place over the cam. Install the four copper washers and nuts to secure the cmshaft holder. Torque them to 13 ft/lbs in a criss-cross pattern. 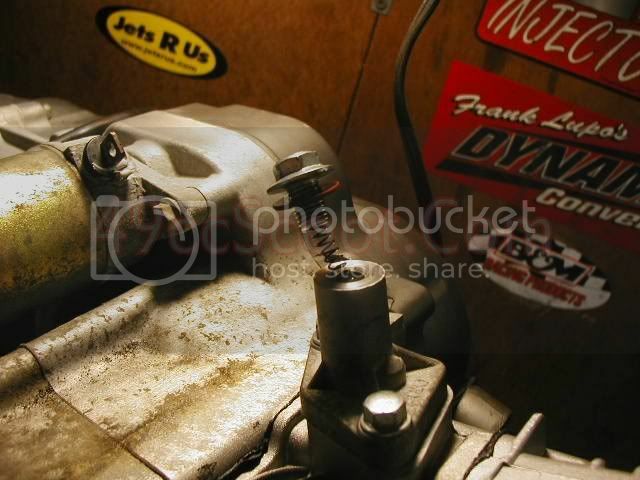 Torque the cylinder/head bolts on the side of the engine to 8 ft/lbs. 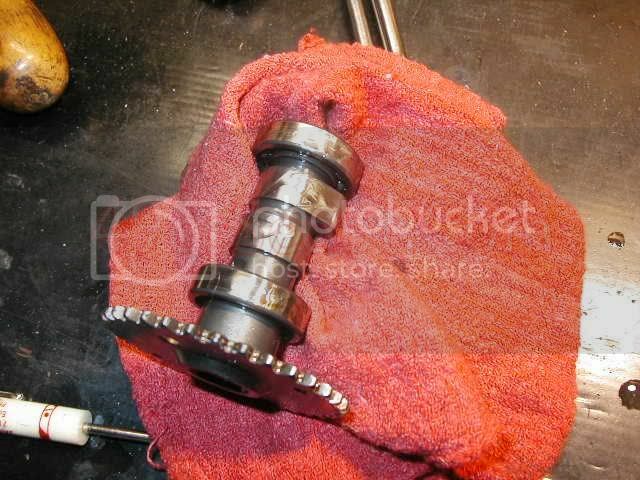 Next, reset the cam chain tensioner. 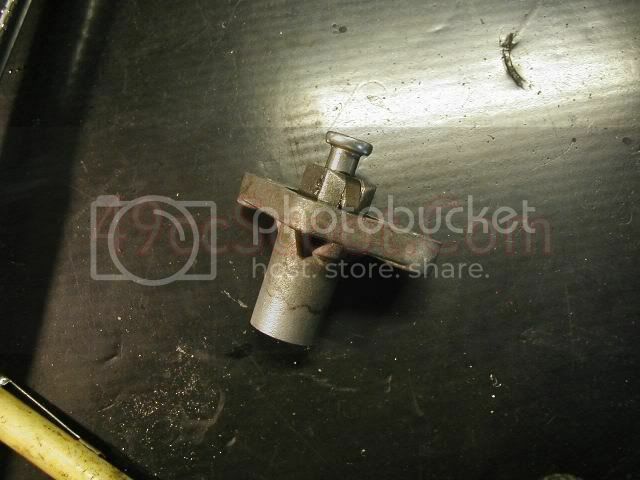 If yours is like the one pictured, simply hold teh locking mechanism in and push the pin in as far as it goes. 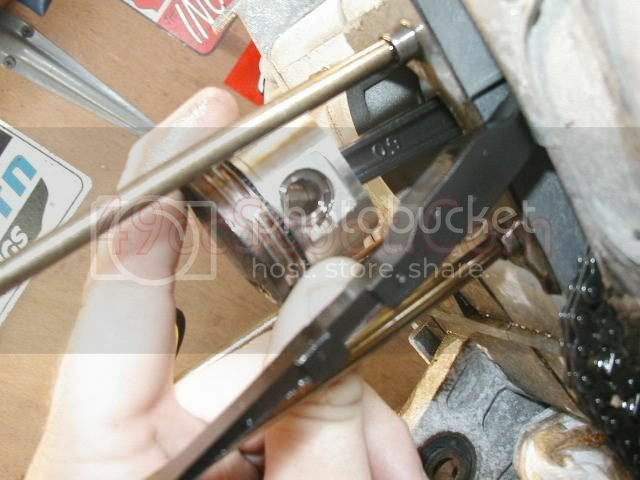 If your tensioner is the screw top model, turn the flat head screw while you push the pin in. 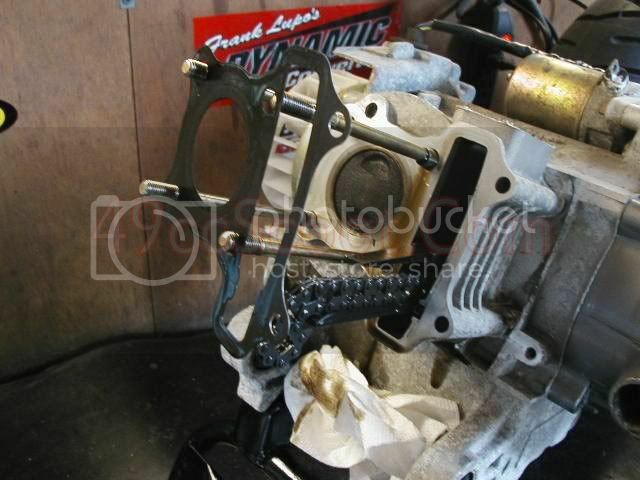 Install the cam chain tensioner onto the cylinder with a new gasket. 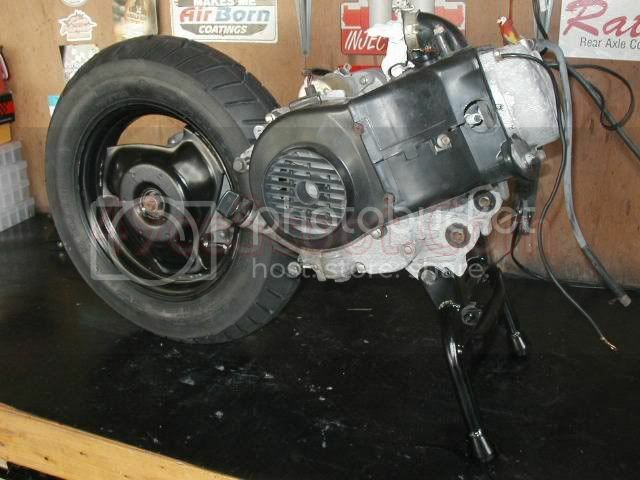 Insert the spring and install the bolt and gasket, or simply replace the screw on some models. Use feeler gauges to check the valve lash. 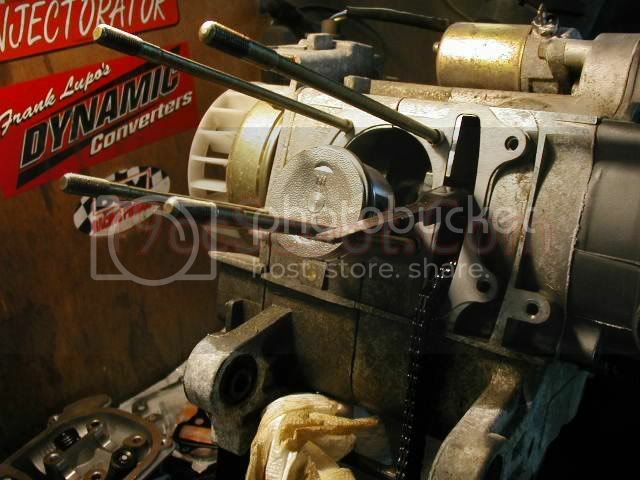 Insert the feeler gauge between the tip of the valve and the rocker arm's tip. The correct measurement should show only slight resistance when moving the feeler gauge back and forth. 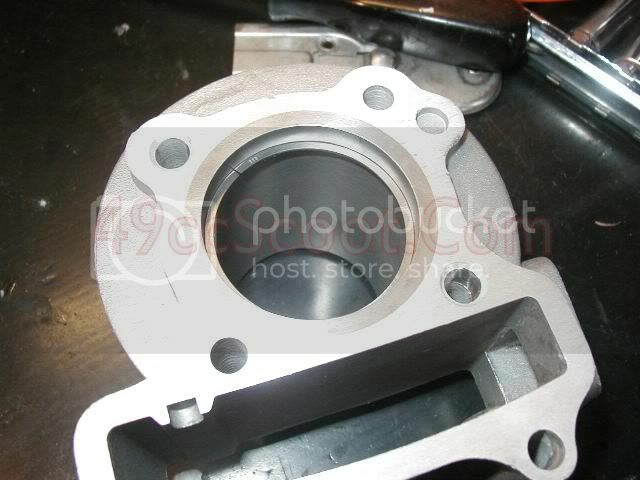 I use .003" of clearance for the intake valve and .004" of clearance for the exhaust valve. Some people prefer both valves at either .003" or .004". I've seen some people gap them as high as .005". The service manual I have suggest .002". 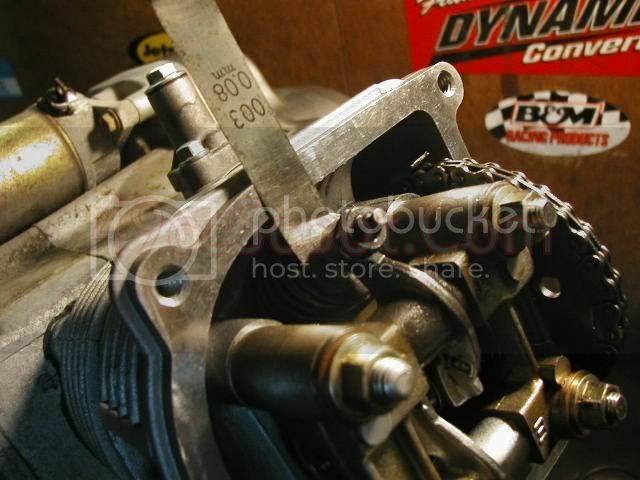 .003" and .004" have worked well for me on both 50cc and 150cc GY6 engines. If the valve clearance does not match up to your desired specifications, loosen the nut securing the adjuster using a 9mm wrench. Now you should be able to turn the adjuster with your fingers. 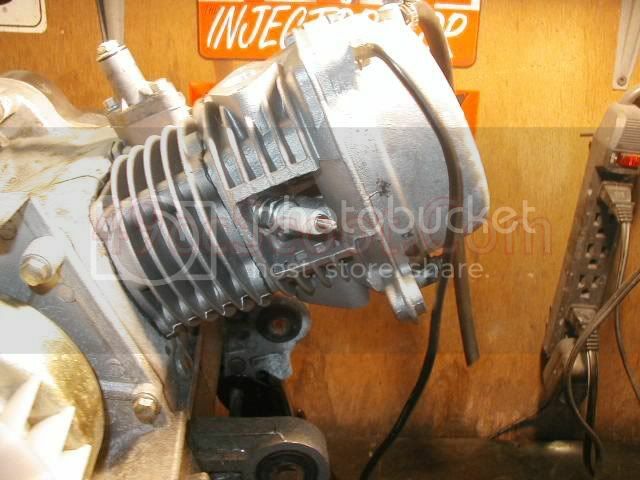 Insert the appropriate feeler gauge and move it back and forth while you turn the adjuster. Stop when you feel slight resistance. 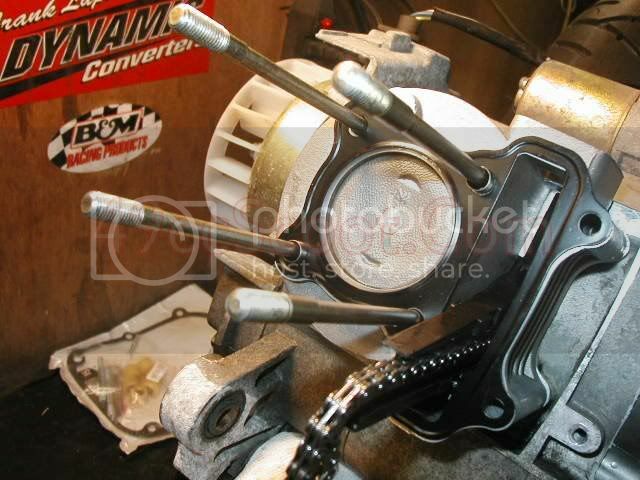 Now hold the adjuster using a small adjustable wrench or pliers while you tighten the nut with a wrench. Once you have the nut tight, make sure you haven't changed the vavle clearance when tightening the nut. If you have altered vavle lash, repeat the process. 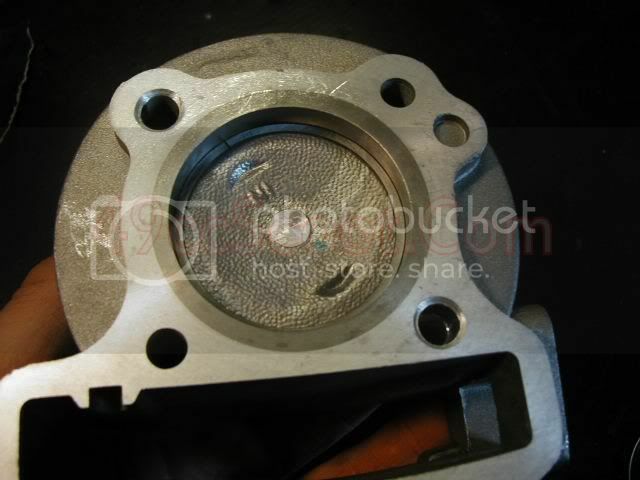 Inspect the valve cover gasket and replace if necessary. 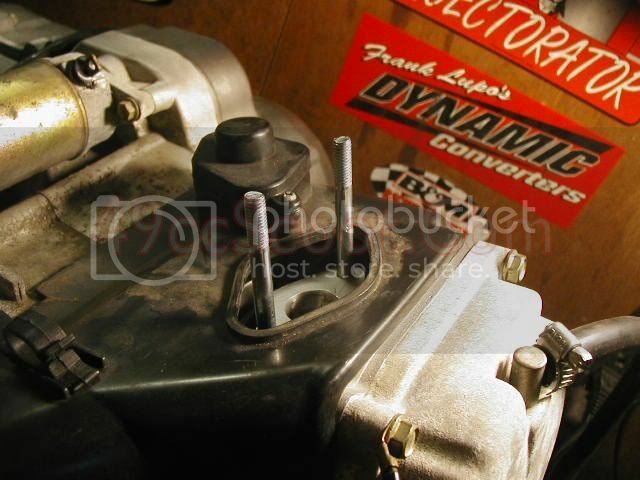 Install the valve cover and tighten the bolts in a criss-cross pattern. Now is a good time to inspect your valve cover breather hose for cracks or wear and replace it if necessary. Get a new spark plug and gap it to your desired specifications. I usually gap them to .028". If you are using iridium plugs be very carefull checking and gapping them. The tip is fragile and can be easily broken. Some suggest skipping over gapping iridium plugs altogether. 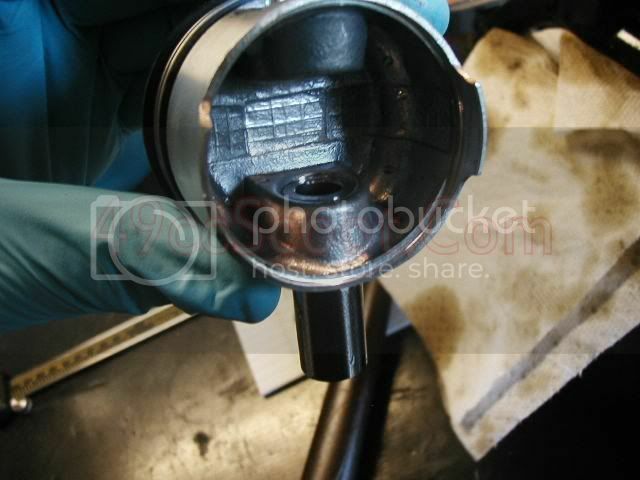 Once your spark plug is gapped properly, apply some anti-sieze to the threads and install it in the cylinder head. Re-install the engine covers and cam chain tensioner cover. 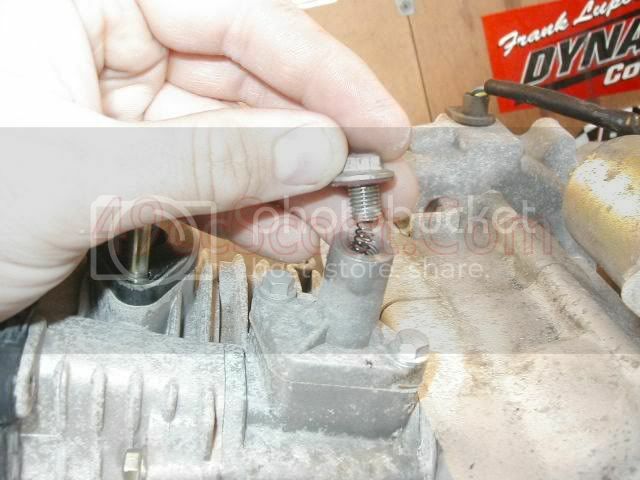 If your are using a new cylinder head, you may need to install intake manifold studs into it. Tighten them to finger tight. 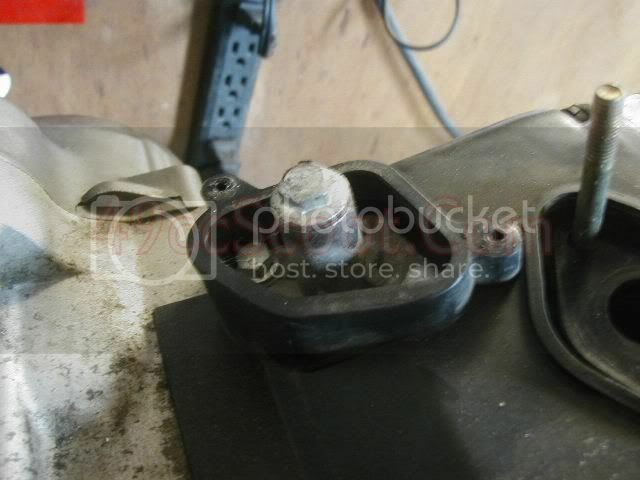 They will tighten more when you install the intake manifold nuts. 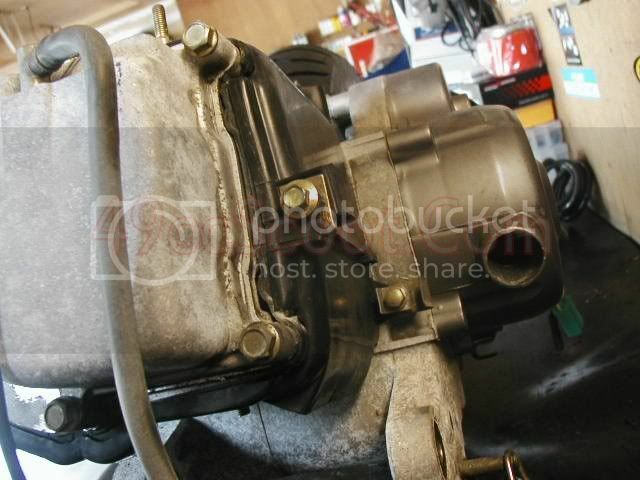 If you haven't done it already, remove the intake spacer from the old head. Check the condition of the o-rings and/or gaskets and replace them if necessary. 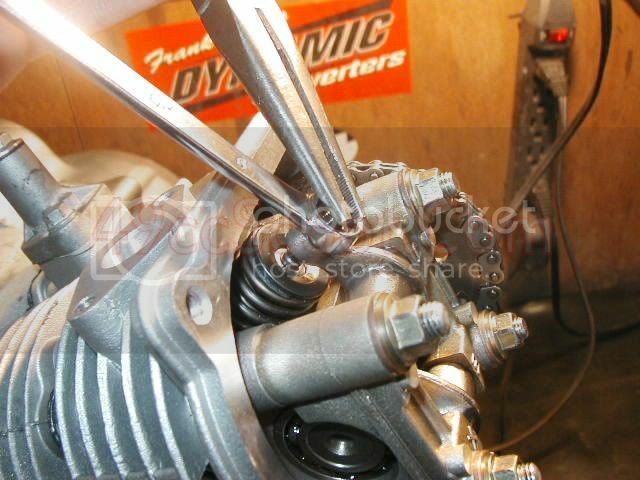 Install the spacer on the new cylinder head. 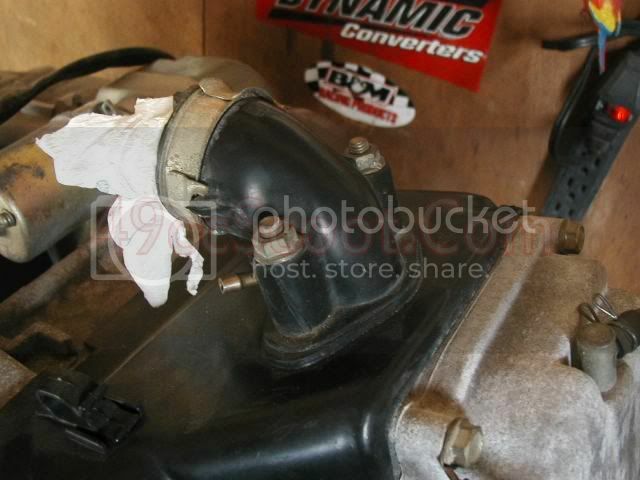 Slide the intake manifold over the studs. 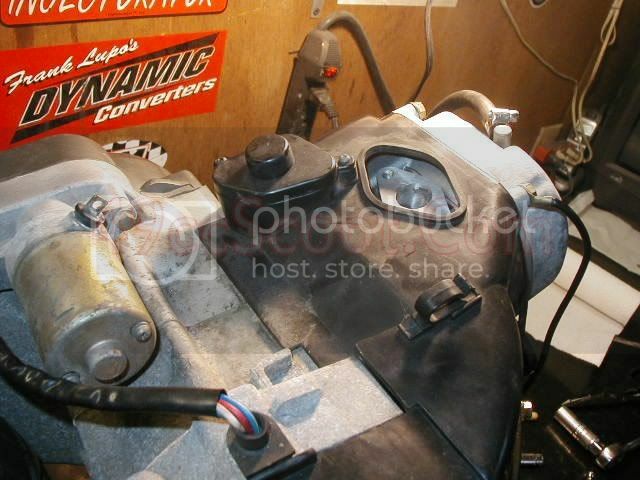 Install the intake manifold nuts and tighten them to 8 ft/lbs. 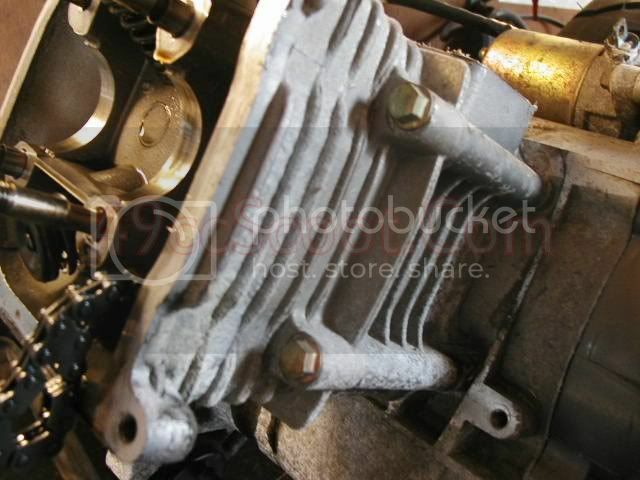 Install exhaust studs if using a new cylinder head. 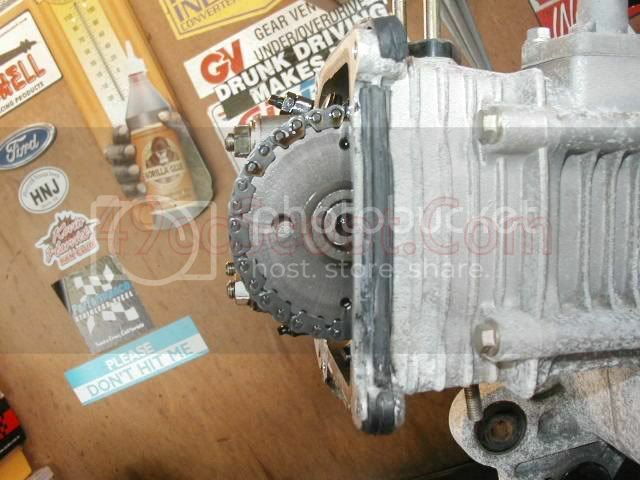 Now you are ready to install your carburetor, air filter, and exhaust. Once that's done you can put it back in your scooter. I would suggest performing an engine oil change prior to starting the engine. Once you get your new engine running, adjust the idle mixture and speed settings. Take a short ride and open the throttle all the way if possible. Shut the engine down from WOT and coast to a place to check your spark plug. 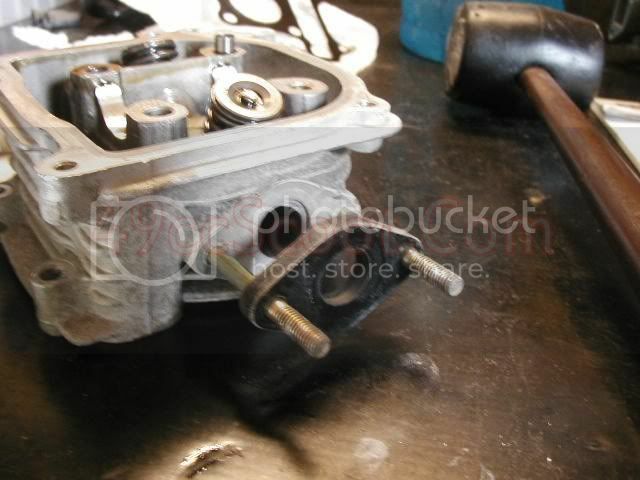 If the plug is showing a lean (white) condition you will probably need to install a larger jet(s) in your carburetor. 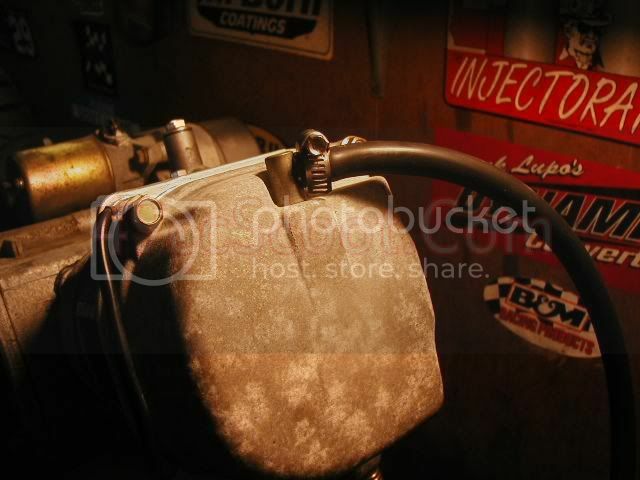 Take your time tuning the carburetor. It will pay off in both performance and reliability.